What's the best way to fix a broken-off power port on an Acer Extensa? If you said "glue the sucker back in there", you might just work in Office Depot's repair department. You're also, in that so-painfully-obvious-it-hurts-my-face way, real wrong. "I detailed the issue to the Office Depot Warranty operator, and he specifically wrote "Problem: AC port loose. glue melted from last fix. AC adaptor gets extremely hot" on the work order. I again sent the laptop off hoping the problem would be fixed. My hopes were too high. 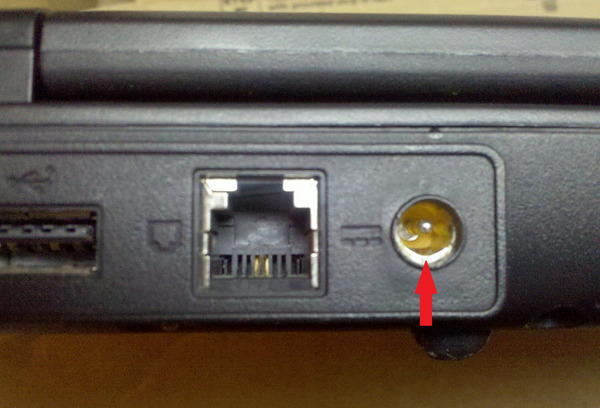 Turns out, glue the power port so it is usable is a masterful fix when compared to the attached photo. As you can see... again the service people glued the power port back into "place." Though this time it is glued in off centre, and can not be plugged in. Obviously whoever office depot sends their laptops off to for service does not even check to see if their "fixes" are functional. An added bonus is that my expansion slot cover is now missing. So not only do I receive a broken laptop, it also has a part stolen."